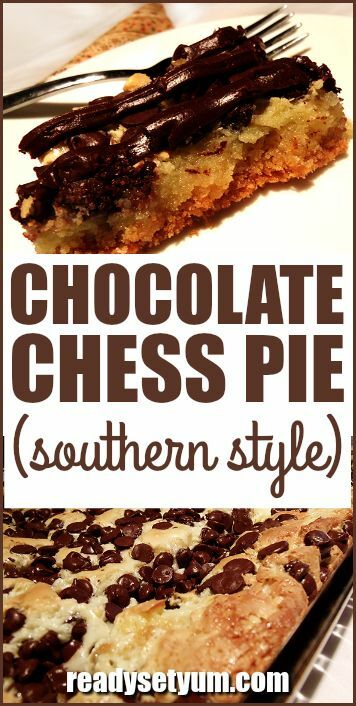 Decadent Southern Style Chocolate Chess Pie - Ready. Set. Yum! Like the sound of cream cheese and semi sweet chocolate? Does said combo make your mouth water just thinking about it? 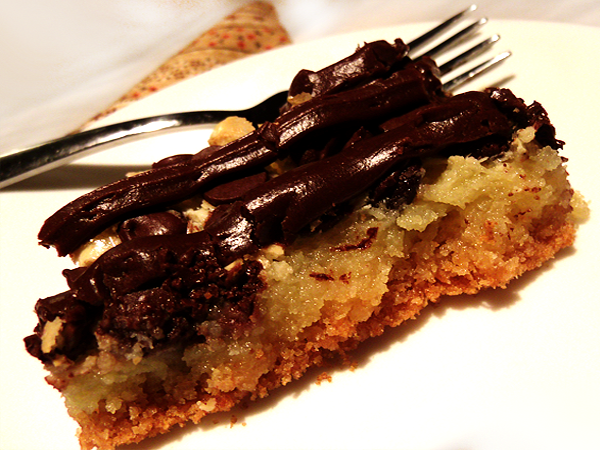 If so, you’ll love love love this confection that is a bit of a cross between a cake and a pie! Salt to the sweets! That is the important thing I learned (or re-learned) after years of making this delicious dessert. Always a huge favorite at any of our family gatherings, it has seen more tweaks than maybe anything I’ve ever baked. The problem? Though incredibly yummy, it was just too sweet. Because it was so super rich, it desperately needed to settle down just a little bit.. Of course the first thing I tried was cutting down on the amount of sugar, and that didn’t work. Wasn’t sweet enough, lost some of it’s richness, blah blah blah. Decided that semi-sweet chocolate chips was definitely the answer. Wow! Those chips sure did turn it up a notch or two but it still wasn’t perfect. Still a little too sweet. Maybe add a semi sweet drizzle? Yes, it was really really good but still not perfect. So I tweaked the butter, the eggs, just about everything and then I remembered what my mother pointed out to me long ago. “Salt to the sweet”, she’d say. It was a method I already employed with some of my candies, and it did the trick! Adding a half teaspoon of salt took this dessert from amazing to hot-damn delicious. Another lesson from dear Mom, “butter makes it better”. Pretty much whatever you are cooking that gives you the choice of butter, margarine, or oil, do yourself a favor and go with the butter. Butter makes it better. Just one of life’s universal truths. Speaking of butter, take a whole stick of it and melt it in the microwave. Doesn’t matter if it is completely melted, just super super soft. In a large mixing bowl, empty out a whole package of yellow cake mix. Any brand will do, but I like Duncan Heinz Butter Golden. I’ve tried most all of them and this one just seems a little bit more flavorful. 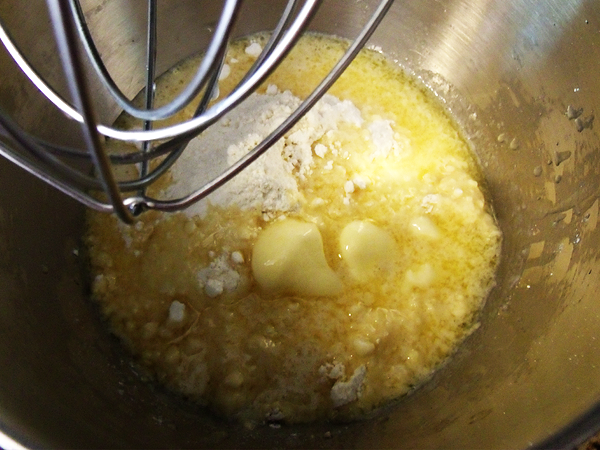 Pour the melted butter into the mixing bowl right on top of the cake mix. Mix for about a minute, just long enough to throw them together, then add one egg. Beat on low to medium speed until well mixed. It will look kind of like a big lumpy ball when it is ready. 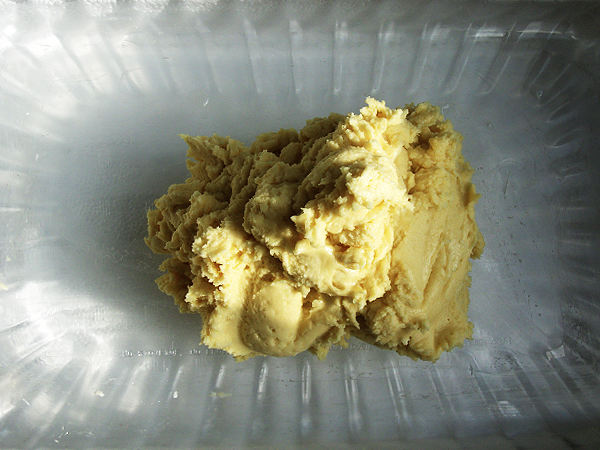 Transfer from the mixing bowl and plop it down in the middle of a lightly greased 13×9 OR 13×11 inch baking dish. It works well in either one. The smaller one obviously makes the finished product a little thicker. The one below is glass, and though you can use a metal one, you run the risk of over-browning the bottom. Rub a little butter on your hands and start spreading and flattening the ball until you have covered the bottom of the dish. As you get to the edges, try not to actually touch the edge. As it cooks it expands a bit and if you take it to the edge or up the sides you’ll end up with a side crust on all the edge pieces. You don’t want this. What I do is as I get to the sides of the dish I make an effort to spread a little bit thinner just to be on the safe side. Transfer to a mixing bowl, then gradually begin adding a 16 oz box of powdered confectioners sugar. Start with about a third of the box, mix it with the cream cheese, then another third, mix again and so on. If you try and add it all at once you run the risk of getting lumps of powdered sugar that are the devil to get blended. Do it gradually and it’ll be fine. Once you’ve blended the dickens out of this, add three eggs, a teaspoon of vanilla extract and YES! The SALT! Add a half teaspoon of salt and mix until everything is nicely blended. It will be like a thick uncooked custard, which is kind of what it is! Put the dish in an oven preheated to 400 degrees and set your timer for 50 minutes. When the time elapses, check it. You want it to be nicely brownied on top, but to the GOLDEN BROWN stage, not the dark brown. If it isn’t yet GOLDEN, let it go another ten minutes or so. I hate to be vague but just like microwaves, ovens tend to vary as well. They shouldn’t, but if you’ve ever used more than one oven you’ll know what I mean. When it’s ready, remove from the oven and allow to cool completely. This typically takes about an hour. Now you have a choice. You can leave it as it is, which is very very good, and my favorite way to eat it, OR you can add semi sweet chocolate drizzle. It is up to you. Either way you are in for an amazing treat! Remember, Love Madly, Laugh Loudly, and Eat Like a Boss! In large mixing bowl, blend together melted butter, cake mix, and one egg. Pat and spread blended mixture over the bottom of a 13x9 or 13x11 lightly buttered baking dish. In large mixing bowl combine 1/3 box of confectioners sugar with softened cream cheese. Mix and gradually add remaining confectioners sugar until all is well blended. Add remaining eggs, vanilla, and salt. Mix until smooth. 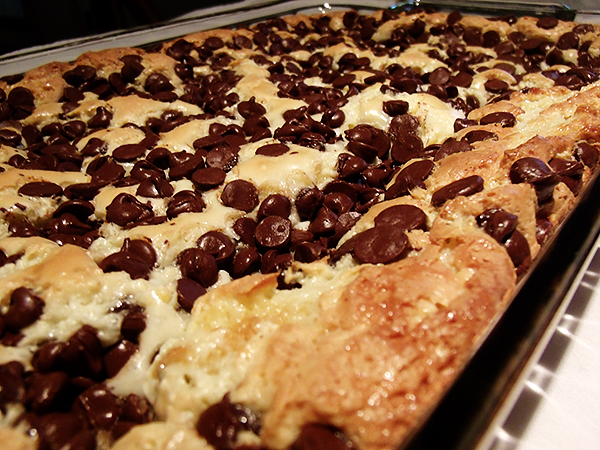 Scatter chocolate chips evenly over the top. Bake in 400 degree over for 50 minutes or until golden brown. Cut into twelve squares before serving. 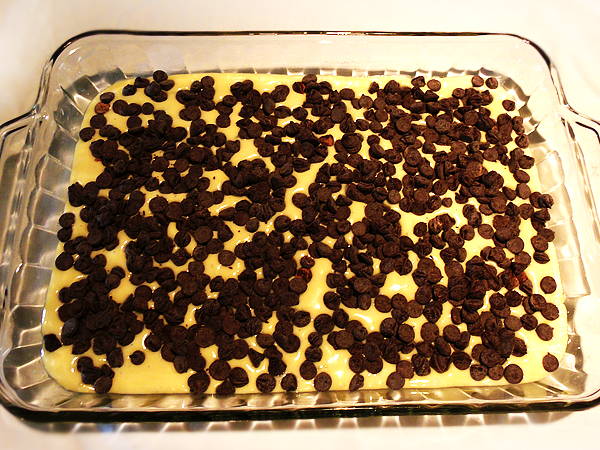 In microwave safe bowl, melt 8 oz (1 cup) semi sweet chocolate chips with 4 tablespoons butter. Microwave at 25 second bursts. then stop and stir. Repeat the process until the mixture is easy to stir and most all of the chips have melted. Remove from microwave and add a pinch of salt. Stir until all the chocolate pieces are smooth and of a pouring consistency. Using a spoon or a drizzling nozzle, use a sweeping motion and drizzle over the entire top of the chess pie. This should be done quickly as the chocolate will re-harden somewhat after cooling.